The Continental Congress adopted the Articles of Confederation, the first constitution of the United States, on November 15, 1777. However, ratification of the Articles of Confederation by all thirteen states did not occur until March 1, 1781. The Articles created a loose confederation of sovereign states and a weak central government, leaving most of the power with the state governments. The need for a stronger Federal government soon became apparent and eventually led to the Constitutional Convention in 1787. 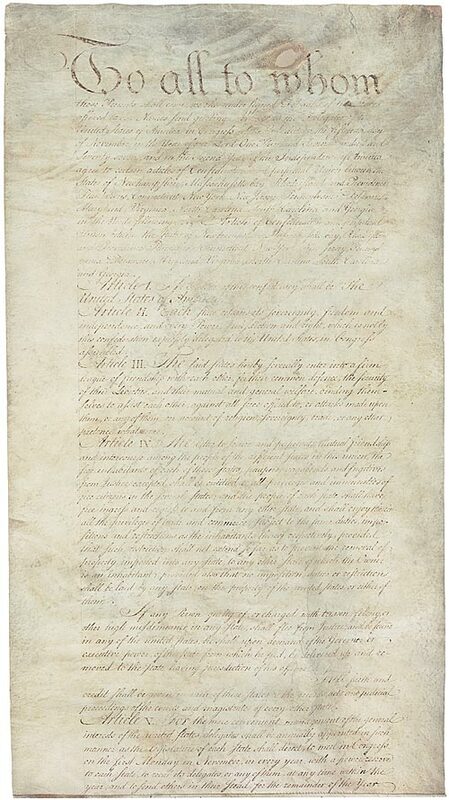 The present United States Constitution replaced the Articles of Confederation on March 4, 1789. "The United States of America". 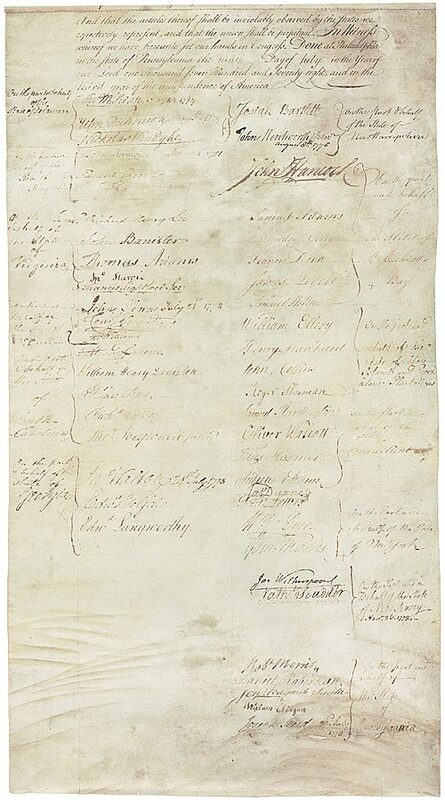 The United States in Congress assembled shall have authority to appoint a committee, to sit in the recess of Congress, to be denominated 'A Committee of the States', and to consist of one delegate from each State; and to appoint such other committees and civil officers as may be necessary for managing the general affairs of the United States under their direction -- to appoint one of their members to preside, provided that no person be allowed to serve in the office of president more than one year in any term of three years; to ascertain the necessary sums of money to be raised for the service of the United States, and to appropriate and apply the same for defraying the public expenses -- to borrow money, or emit bills on the credit of the United States, transmitting every half-year to the respective States an account of the sums of money so borrowed or emitted -- to build and equip a navy -- to agree upon the number of land forces, and to make requisitions from each State for its quota, in proportion to the number of white inhabitants in such State; which requisition shall be binding, and thereupon the legislature of each State shall appoint the regimental officers, raise the men and cloath, arm and equip them in a solid-like manner, at the expense of the United States; and the officers and men so cloathed, armed and equipped shall march to the place appointed, and within the time agreed on by the United States in Congress assembled. But if the United States in Congress assembled shall, on consideration of circumstances judge proper that any State should not raise men, or should raise a smaller number of men than the quota thereof, such extra number shall be raised, officered, cloathed, armed and equipped in the same manner as the quota of each State, unless the legislature of such State shall judge that such extra number cannot be safely spread out in the same, in which case they shall raise, officer, cloath, arm and equip as many of such extra number as they judeg can be safely spared. And the officers and men so cloathed, armed, and equipped, shall march to the place appointed, and within the time agreed on by the United States in Congress assembled.